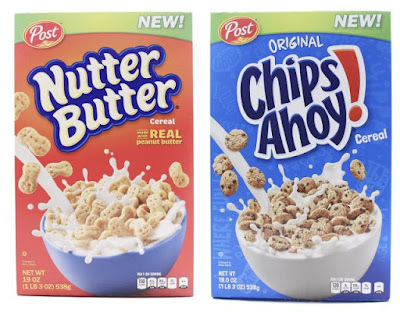 New Nutter Butter and Chips Ahoy cereals are coming soon exclusively to Walmart. Both cookie-inspired cereals can be purchased online starting December 22, 2017 and in stores nationwide beginning December 26, 2017. Chips Ahoy cereal aims to put the flavor of the cookie into cereal form and bears more than a passing resemblance to General Mill's Cookie Crisp cereal. Nutter Butter cereal features peanut-shaped cereal with a creamy coating made with peanut butter. Both cereals will come in 19-oz boxes with a retail price of $3.98. They'll be available only at Walmart until April 1, 2018.